When I first heard about the ADI-2 Pro some months ago, I was indeed very interested. I read some more news on professional audio sites but some of the jargon I did not understand. I’m sorry, I have to admit, I’m an audiophile who loves to listen to music. I might have collected some experience over the years, but I did not graduate as a sound engineer. Simply put, the ADI-2 Pro was not calling my name. It did not shout “hey you! You need this!” But some force kept pulling my interest. In hindsight, I think it was my acceptance of lack of knowledge in the functions of DACs and the will to fill that hole. At the very least, I would review a DAC/ amp solely on performance, right? So I reached out to RME and I am so happy that I did! Aside from the incredibly detailed hard copy of the user manual, when asked, RME helped me to explain some of the functions in more detail – but never had anybody tried to manipulate my subjective experience or even commented on what I heard (or not heard). Nevertheless, while fighting through over 80 pages of the handbook, I always had one tab open for Wikipedia to further understand what is actually happening. Of fear I might be writing a manipulative marketing text, I left some parts uncommented, but in the end, all my findings helped to form my final verdict. 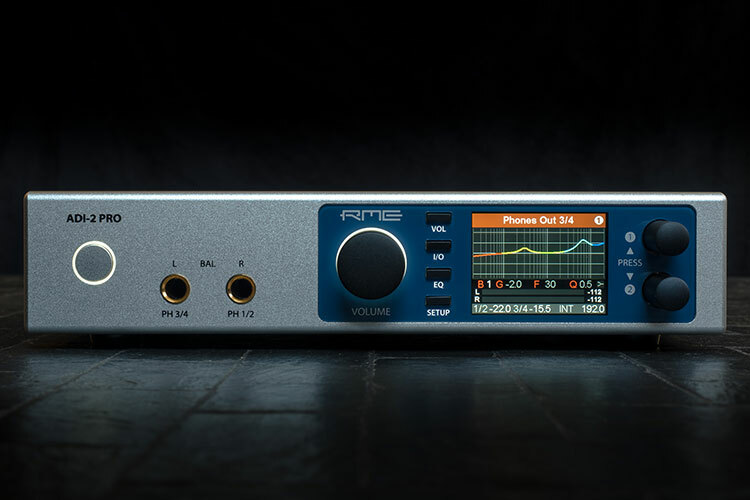 I was surprised by the almost consumer-friendly packaging from RME. More often than not, I receive some branded cardboard boxes with expensive hifi equipment. For a professional tool, I did not expect a white box with sleeve, well-done product photography and a simplified product overview. It’s definitely a nicely done presentation that just asks to be picked up in a store and could possibly attract non-professional consumers. In the box, you will first find a very detailed, comprehensive and colored manual. The user guide is insanely well written. It explains all functions in detail across over 80 pages. It also provides measurements and graphics where necessary. It took me quite a while to read it and I had to check it a few times after that too. Ideally, the purpose of professional and high-fidelity equipment is the same, but vocabulary isn’t. You can always find the latest and updated PDF online: https://www.rme-audio.de/download/adi2pro_e.pdf. Next to the main device and it’s 100 – 240 V power adapter, you will find a multi-purpose cable for the digital input/ output port. It also allows coax in and out. From a professional tool, you should expect some great build quality. You see, professionals are different to us audiophiles. They don’t place their newest hifi device on an altar and worship it every night before going to sleep. Some professionals even manage to break hard acrylic in-ear monitors. Something that always astounded me. Luckily RME has enough experience to not slouch a single bit for the build quality. The ADI-2 Pro is built rock solid. Well, maybe not as unbreakable as the Chord Hugo (reminder: it was run over by a tank) but definitely well enough to survive any excessive home use. Front and body are made from metal. Underneath is four thick rubber feet installed for a solid placement on the desktop or on top of other devices. Connections are gold-plated where needed. The ADI-2 Pro has three dials on the front that also function as buttons when pressed. At first, I thought they’re made of plastic but they’re actually made from black aluminum. The big volume knob has a wee bit space to wiggle around. The other two dials are extremely firm in their place. Next to the volume controls you will find four plastic buttons to access the main PCM/ DSD functions and a display. I can’t tell if the IPS panel is protected by glass or plastic, but it doesn’t really matter as it’s not a touch-sensitive display anyway. I will make this short: I think the ADI-2 Pro is extremely well built and I do not have any quality concerns at all. As for design, the ADI-2 Pro definitely has its own style. It looks very professional and doesn’t try to trigger any emotions with its very neutral color choice. A silver front on a black body took me a while to get used to. Usually, DACs or amps are either black or silver, but RME decided not to offer a color choice and just mixed both of them. I wouldn’t be surprised if we’d see an all black version next year, though. Added to the silver front is a dark blue frame around the buttons and display, which I guess was necessary for the corporate identity. However, RME did add some geeky touches. There are lights underneath the power button and volume control. A cold white ring will appear when powered on and it looks amazing. For the full geek effect, I advise to turn on the RME spectral analyzer that will throw you back into the 90s when we were all still rocking WinAmp software – with a green 30 bands old-school visualizer. All in all, the ADI-2 Pro is a humble device that does not attract attention when turned off. When in use, the display will definitely catch your eye, though. When in use, the ADI does generate some heat. I would make sure it has enough space on top and on the sides. In the following, I will separate this review into three major parts. The ADI-2 Pro is three killer devices packed into one housing: ADC, DAC, and head-amp. But for us headphone geeks, the ADC part is probably not so important. 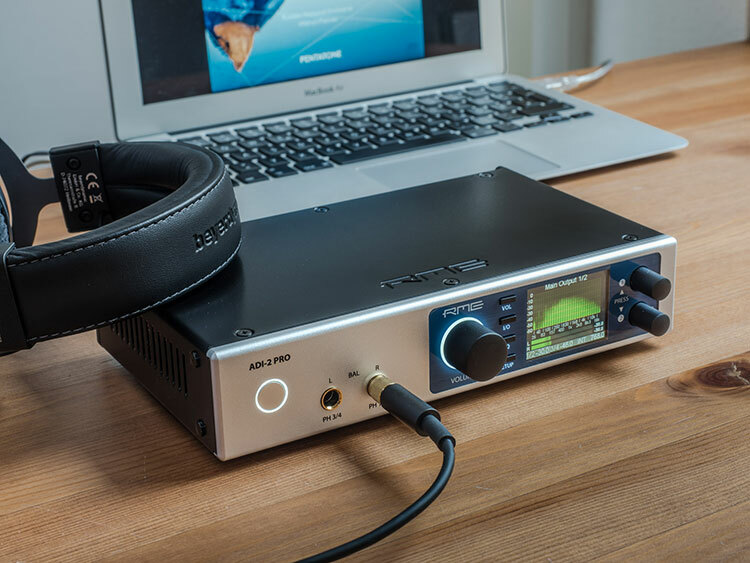 My review of the ADI-2 Pro is aimed at valuating its performance as DAC and headphone amplifier for home music listening. The ADI-2 Pro provides two separate headphone outputs, both with 6.3mm jacks. 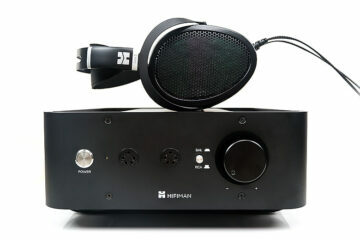 You can link both and use them as a balanced output, too, but since this “pro” connection is rarely seen with audiophile headphones, you probably have to purchase an adapter cable separately to make use of the balanced mode. As for feeding the amp, the ADI-2 Pro does not use conventional RCA plugs. 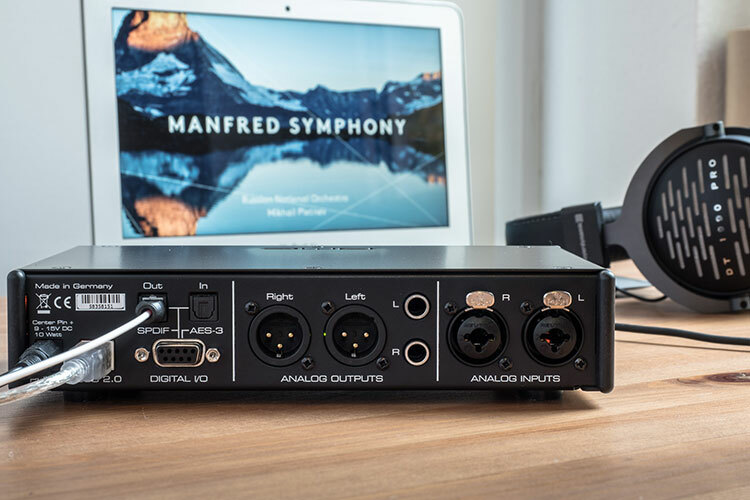 If you want to separate the integrated DAC from the amp and input analog signal, you can either use balanced XLR or unbalanced 2x 6.3mm connections. I had to order some Cordial CFU-PC cables to make use of the rather uncommon 6.3mm connections. This is where the ADI-2 Pro shows that it is a professional tool rather than a home hifi device. My first impression of the built-in dual headphone amplifier was absolutely superb. I plugged in a set of sensitive custom in-ear monitors and the background was dead silent. Through the intelligent auto-mode active in the background, the amp output immediately jumped down to low-gain, still giving out enough power to blow off your head. Thus I highly appreciate the digital volume control. It recognizes acceleration and you can quickly change the volume in big steps or adjust it slowly in 0.5 dB steps above -69.5 dB and even in smaller steps below that. The lowest volume output is -96.3 dB and I usually feel comfortable around -30 dB with full-size headphones or -60 with sensitive in-ears. This means that the ADI-2 Pro allows plenty of room, as well as extreme volume precision for users who prefer to listen to music at low volumes. In Hi-Power mode the volume blasts all the way up to +22 dBu, a level that I could not reach with any tested headphone. Spending some more time using ADI-2 Pro’s amp, I learned to love it even more. The sound character can be described as full-bodied with great space. It might be a bit warmer than what I consider reference, but not by much. The treble is soft without blurring details. The ADI-2 Pro declassed the Chord Hugo with a darker background, lower noise, and less hiss. It also created a better intimacy without costs of soundstage depth. Badly mixed recordings with troublesome highs let the Lake People RS 08 come through with stronger sibilance, but the RS 08 also managed a little bit better dynamics and I’d consider the Lake People Reference amp as the more transparent device. But this could already be considered tackling Goliath. Having that said, my personal preference still lies with the similarly tight and less analytical sound of the ADI-2 Pro as an amp alone. Yes, it’s that good. Not only is the amp powerful and precise, but best of all it comes with two outputs that can be – but don’t have to be – regulated separately. A nice little detail that I found is that audio fades in when you plug in the headphones. It gives you time to react to the last set volume. If you were wondering about the labeling, the PH 3/4 output on the left is basically the main headphones output. The channels 1/2 are identical, but they are linked to the rear outputs as well. Meaning they are used to monitor the signal that is handed to the studio monitors or whatever the connection leads to. If you use headphones only, you can use both outputs absolutely equally. The DAC chips built into the ADI-2 Pro are none lesser than those from the Japanese high-end brand Asahi Kasei Microdevices. RME treats us with two dual chipsets of Verita AK4490. A choice that, among others, enables the possibility of 32bit 768 kHz, native DSD, and a non-oversampling DA filter. A quick internet search shows that the same DAC chip can also be found in competing hifi devices. This does not mean that the other hifi equipment performs similarly or uses the chipsets in the same way, but rather that AKM is a recognized manufacturer for hifi DACs. I’d describe the DAC as very full and nearly transparent sounding. In direct comparison with the Chord Hugo, the treble is tighter and less fuzzy sounding. After extended use, I came to the conclusion that the RME is less fatiguing. The ADI also avoided sibilance a bit better than the more analytical sounding Reference DAC 02 with USB X 24/192 from Lake People. Taken from my A/B testing notes, I’d say the RS 08 reference head-amp can output a wee bit better clarity when fed from the RS 06, but the ADI-2 Pro digital output provided an overall weightier sound. Quite possibly to the liking of those looking for an analog musical sound. In the end, this is a matter of preference. I really like how the ADI-2 Pro gives life to the music. The DAC’s performance can be further tuned to personal preference as I will introduce in the third section, the features. My sound review verdict is based on the SD sharp filter. As for digital inputs, you can use USB, Toslink, and Coax. You can also use Toslink and Coax outputs. There should not be any technical advantage over either, meaning the full range is available to both connection methods. Taken over from the professional audio sector, RME also installed digital XLR in- and outputs. By default, the ADI-2 Pro uses an asynchronous sample rate converter. The digital input is resampled without adding artifacts or noise. The main purpose is to decouple the clocks of the input sources and synchronizing them in a professional environment. 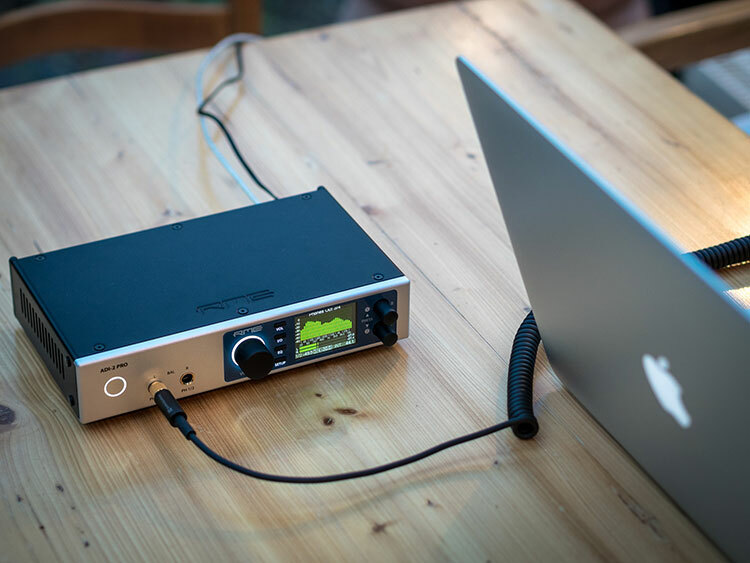 It can also be used to upsample and convert audio up to 192 kHz. More important, however, is the active use of SteadyClock. SteadyClock is RME’s solution to jitter. The ADI-2 used the first version of SteadyClock whereas the Pro version now implements the 2nd version upgrade. This time, jitter is reduced by over 50dB, a significant improvement from the 30dB jitter reduction of the original ADI-2. SteadyClock III is supposed to clean a highly jittered 50ns input signal below 1ns. That is reference output material. 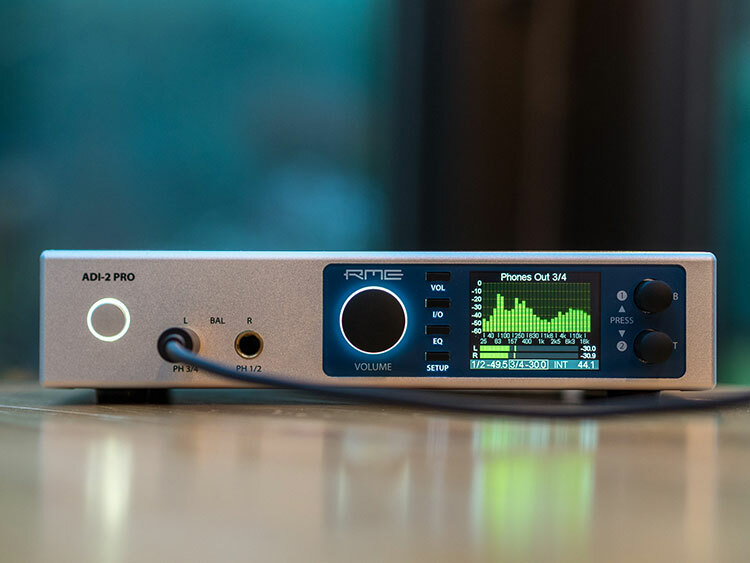 RME allows you to define the ADI-2 Pro as master and forward the “cleaned” digital signal to a slave DAC. Most audiophiles probably use a dedicated portable media player, like the Cayin i5, Opus #1, AK70 or better. But the saying photographers tend to repeat, “the best camera is the one you have with you”, also counts for listening to music. The iPhones are not bad PMPs at all – at least the ones with a headphone jack. Though iOS wants to limit audio to 24-48, there are workarounds for HD audio but they need an external lightning-DAC and an app that allows high-res audio. As it happens, you can use the ADI-2 Pro with Apple camera connection kit (CCK) the same way we are used to from Chord products. When connected, the ADI-2 Pro will immediately recognize the iDevice in auto-mode and let you enjoy fully amped audio with your favorite full-size headphones. Of course all options like EQ, bass boost, crossfeed, etc. are available as if you were using any other source. iOS support makes a lot of sense if you use an iPad for producing music. The App Store offers some amazing DJ apps for creators and as a “Pro” user you can test your pieces on professional equipment with just a simple connection. I see you had the Beyerdynamic dt 1990’s plugged into them. How did they sound with the ADI-S PRO? is it possible to use the SPDIF I/O in the iOS system (iPad) ? The latest firmware update allows to lower the loudness settings as requested in the review!